New Delhi, Oct 29 (IANS) Home Minister Rajnath Singh on Sunday met National Award-winning actor Akshay Kumar and lauded his efforts towards helping the Indian Army. “Met Akshay Kumar… Appreciated his efforts towards supporting the families of India’s bravehearts,” Rajnath tweeted alongside a photograph of himself with the “Airlift” actor. 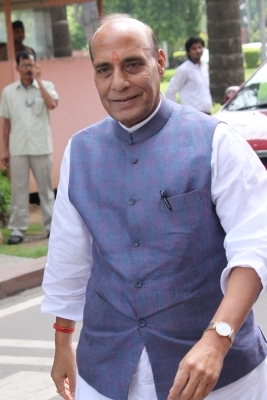 Launched by Rajnath Singh and Akshay in April, ‘Bharat Ke Veer’ aims to facilitate online donation directly to the families of paramilitary troopers who have sacrificed their lives for the country since January 1, 2016.